Why Won't There Be a Champs-Elysees Christmas Market This Year? Studying current events helps to bring families together and helps parents know what is going on in their children's hearts and minds. That's why each week in our newsletter, we equip homeschool families to discuss the issues of the day with our Hot Chocolate and Current Events spotlight. This week, we take you to Paris, France to the Champs-Elysees (shahn-zay-lee-ZAY) for another seasonal Hot Chocolate and Current Events. We take a look at European Christmas markets, staples of cities and villages across the continent, where people can buy hot drinks, handmade crafts, and delicious confections. Begin by discussing the concept of Christmas markets with your students. What is appealing about them? Are there similar markets around where you live--why or why not? Why do you think Europeans like Christmas markets? Would you have liked to experience the Champs-Elysees market? Who decided to shut down the 2017 market and why? What kinds of things were being sold at the market, and what kinds of things did Jean-Francois Martins say should be sold? Do you think that the goods sold at the Champs-Elysees market should be "made in Paris"? Why or why not? What kinds of good do you imagine city officials are thinking of? Can you give examples of things you think tourists and Parisians would like to buy? If your city or town held a Christmas market, what do you think should be sold there? Do you think Campion made some bad or unethical decisions as a businessman? Would you want to work with Campion if you were the mayor? How could both Campion and the mayor have handled the situation differently? Every week in our newsletter, we help homeschool families and co-ops discuss current events...with a cup of hot chocolate. Read more about our Hot Chocolate and Current Events initiative here. This week, we have a holiday-themed current event: the globalization of the cranberry. Read this article from Wisconsin Public Radio. Easier yet, you can just play the accompanying audio clip. For further information, click on the links in the article—they are pretty interesting as well. Get the conversation started by asking your students if they like cranberries. What are their favorite cranberry dishes? Do they think canned cranberries are real food? Next, look at the chart, “Cranberry production in Wisconsin and Canada, 2007-2016.” What does it show? Based on the chart, if you were a cranberry grower, describe the good things and bad things about your situation. The first paragraph of the article states the basic law of supply and demand. What is it? Why did the cranberry growers invite buyers, bloggers, and social media influencers from India and China? Would you have included any other countries? Would you have included any other kinds of people? How would you have felt if you were an international buyer or influencer, seeing cranberry production for the first time? What questions would you have asked? What was the goal of the Reverse Trade Mission? If you were one of the people invited, what would you do to spread the word about cranberries when you got home? What about cranberries would appeal to people living in China and India? What do you think of the marketing campaigns that have been going on to increase awareness of the cranberry? What has been their impact? Why do you think fresh cranberries cannot currently be imported into China? Why does Brooks Ericsson say that staying in these global markets is important, even though they require an upfront investment of time and money? Do you think the U.S. Department of Agriculture should set production limits? Do you think it’s a good idea to ship fresh cranberries half way around the world? Why has Black Friday lost its significance? Why did Black Friday used to be such a shopping frenzy? Why did the article mention Amazon's summer Prime Day? Why do you think more and more people will shop exclusively online on Black Friday? What do you think of stores like IKEA that choose to remain closed on Thanksgiving Day? Do you think it's a good idea for outdoor gear retailer REI to stay closed on Black Friday? Will you do any shopping on Black Friday? Where will you shop: in stores or online? Why? Know someone who loves history? We here at Silverdale Press love history too. So we wanted to pass along some of our favorite gifts for the history buff on your Christmas shopping list. Who doesn't love to give and receive ornaments? The White House Historical Association puts out a nice one every year. This year's honors FDR. For the Civil War buff, who knew a cannon ornament could be so adorable? 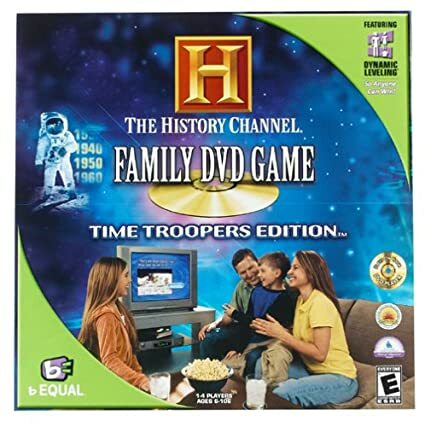 The History Channel Family DVD Game. This trivia game is fun and learning for the whole family. Chrononauts: A very cool time travel card game. Based on David McCullough's bestselling biography, this critically acclaimed series will fill many family movie nights. The founders are always popular. For your early American history buff dad, try a silk necktie printed with the Constitution. Banning Surgery for Smokers and the Obese? The U.K.’s National Health Service is planning to ban survey for patients who smoke or are obese. Make some hot chocolate, kick back with your homeschool family, and read this article from the Guardian. Use the questions to help get the conversation started. To get the latest in Hot Chocolate and Current Events, sign up for our newsletter. NHS: National Health Service. The U.K.’s publicly funded health service. It was founded in 1948 and its services are available to all U.K. residents. Learn more about it here. Royal College of Surgeons: a British professional organization of surgeons. They would be like a special interest group in the U.S., reacting to and developing policy guidance for the NHS. Why would the head of the Royal College of Surgeons call the surgery ban “discriminatory”? Do you think it is? Follow the link above to read a little more about the NHS. Why would the Royal College of Surgeons say that surgery ban violates the NHS’s fundamental principles? What do you think of the NHS’s current policy which delays surgery to give patients time to lose weight or stop smoking? Besides smokers and obese people, should any other groups of people be banned from having surgery? Why do you think the NHS is in financial trouble? What can the U.K. do to alleviate the pressure that it is under? (See the chart that discusses the aging population, budget cuts, staff shortages, and lifestyle factors). If the NHS was not in financial trouble, would they be considering this ban? Why or why not? Do you think that the NHS patients should take responsibility for their own health, or must the NHS treat all patients equally? Should governments encourage people to eat better and quit smoking, or should people be free to make their own choices? Silverdale Press is thrilled to announce the release of the White House Holidays: Christmas Unit Study! Designed for students in grades K-12, this unit study is a great way to create memorable experiences this Christmas. The unit study is brimming with vivid illustrations, rich stories, and creative and meaningful activities. The activities are the same for all grade levels. The level of parental guidance needed will vary with children's ages. Amazon is in the news all the time. The retailer is one of the world’s biggest companies. It has completely changed the way people shop. Kids of all ages should be familiar with Amazon, as it has left a huge imprint on our culture. Read this article from the Seattle Times about Amazon’s latest innovation. Use the questions that follow to spark your discussion. How much do you trust Amazon? What makes a person trust a company? Why do you think Amazon ranks in the top three companies people trust? Is your family a member of Amazon Prime? Why or why not? Why do you think Amazon wanted to start the Amazon Key program? What benefits does it give to online shoppers? What benefits does it bring to Amazon? Do you think people will pay $250 dollars for the Cloud Cam and smart lock? Would you? Do you think Amazon deliverers will accidentally let out pets and steal things? What other worries would you have about letting Amazon into your home? Do you think the safety features the article mentions are enough? If you had Amazon Key, would you feel secure? We here at Silverdale Press love presidential libraries. We also love the holidays. We also love primary sources. Combine all three, and we're over the moon! That's why this week, we wanted to share a fantastic resource as you prepare to celebrate Thanksgiving in your homeschools. The Franklin D. Roosevelt Presidential Library has a great collection of documents online about the 1939 Thanksgiving debacle. This was the year Americans celebrated two Thanksgivings. Check out the link to learn more. After you've examined one or more of the primary sources, apply these helpful document analysis worksheets from the National Archives. Want to learn more? The 1939 Thanksgiving debacle is just one slice of America's Thanksgiving history. For a more comprehensive study, including presidents and primary sources, check out our White House Holidays: Thanksgiving Unit Study.